With no resolution in the immediate future, the partial government shutdown will likely hit the length—16 days—of the full October 2013 government shutdown. Hundreds of thousands of federal employees and contractors have felt the effects of the gap in funding. The new Congress was seated on Thursday and promptly passed a bill to reopen the full government, but the Senate is unlikely to take up the measure. At GovExec, we can't report on all aspects of the shutdown. Here is a roundup of a few story lines about the shutdown from reporting in other news outlets. Native American tribes rely heavily on federal funds and personnel to operate and the current situation has left many in the lurch, according to a Jan. 1 story in The New York Times. The Bureau of Indian Affairs furloughed more than half of its employees, leaving unpaid skeleton crews for most services in native communities. One tribal leader in Michigan told the newspaper "Everything is on the table." The Times enumerated challenges facing the tribal communities including unplowed roads in snow-covered communities and law enforcement gaps. Idaho's Shoshone-Bannock Tribal community said it would be able to operate with full funding until this weekend, but will have to reevaluate next week. Other communities like the Navajo Nation said they would have to move funding around to operate basic services. “It just kind of snowballs into our people doing things that they know they shouldn’t do and further financially obligating themselves,” Russell Begaye, the Navajo Nation’s president told the newspaper. Read more at The New York Times. 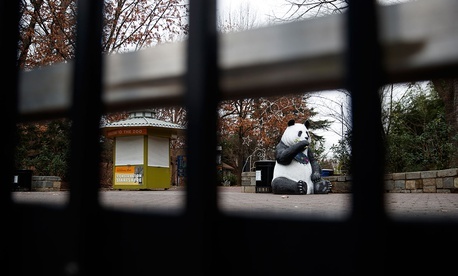 While the Washington National Zoological Park will not see visitors during the shutdown, the pandas, lions and other animals of the zoo need to be fed and cleaned behind the scenes. The zoo is part of the Smithsonian Institution and was able to stay open with existing funds for the first 10 days of the shutdown, but has since been closed to the public. The veterinary staff of the facility will still be working to keep the animals happy and healthy, though. “We plan to maintain the current level of care for the animals, and that’s not going to change no matter what,” National Zoo spokeswoman Annalisa Meyer told the Associated Press. Read more on the Associated Press. The effects of the shutdown will trickle down to state and local governments, our sibling site Route Fifty reports. Mike Wallace, community and economic development program director for the National League of Cities, told the site that "there's no clear path forward" and that local governments must shift money around to fill gaps. The Housing and Urban Development and the Agriculture departments are among the agencies shuttered, leaving grant money, housing assistance and other funds to local governments to assist low-income citizens. “What’s happening to those tenants?” asked Leslie Strauss, senior policy analyst with the Housing Assistance Council. “We have no idea whether they’re still getting their assistance.” Read more at Route Fifty. Americans looking to finance a new home in the new year through the USDA loan program are facing challenges with the government shutdown shuttering the agency. USDA works with private lenders to provide mortgages for home buyers with no down payment requirements, low interest rates and minimal fees to purchasers. With USDA being one of the agencies facing a lapse in appropriations, the program is not operating and homebuyers in the middle of the process are stuck waiting for a resolution. USA Today spoke to one couple who is living out of boxes and paying rent week-to-week to their current landlord as they wait for Agriculture to reopen. Read more on USA Today. As our Eric Katz reported, there are options for federal employees experiencing financial hardship during the shutdown, including banks easing or waiving fees for feds. Feds can also get discounts and deals at D.C.-area institutions like restaurants, theaters and bars. The Hill put together a list of many of the deals, including drink specials and even free meals from some D.C. eateries. According to The Hill, restaurants in other cities with significant federal presences like Colorado Springs, Indianapolis and Cincinnati are also offering discounts for feds affected by the shutdown. Read more on The Hill.